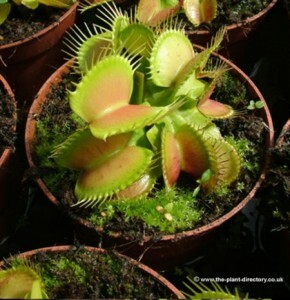 Dionaea muscipula is remarkable plant as it can feed on living insects as well as from peat moss. Dionaea muscipula should be kept in hot sunny position indoor or outdoor. Dionaea muscipula must be kept moist or wet at all times. In summer months the pot may be left sitting in water or on wet sponge. Place pot under a dripping tap for 2-3 hours every three moths. In winter Dionaea muscipula will lose most of his leaves but will regrow these in spring. Remove flower spikes as they start to grow and do not fertilize. Dionaea muscipula can only be fed living insects like small flies but does not need to have them to grow.